Maria was so inviting and wonderful, breakfast was amazing, pool was phenomenal, so quiet and peaceful. LOVE LOVE LOVE this property. My only complaint is that I had to leave. Wonderful hosts .. truly caring about your comfort . Beautiful villas , finished to high standard .. car rental is a big convenience factor . All the staff very pleasant and warm. Tranquil location away from bustle and so well suited for families ..
We stayed in the Livas villa for 6 nights and it was wonderful- a large villa, private pool, sea view and a great seating area with built in barbecue. It’s not cheap, but overall with such incredible accommodation plus car hire, transfers, homemade breakfast etc we thought it was well worth it. The staff were amazing and all the little touches made our stay perfect- complimentary drinks, Maria’s tips for what to see, not having to check out until we departed for the airport- even the lady that came to light candles every night! It all added up to a fabulous and relaxing stay. 10/10 experiance and if you want a home from home this is a great place to stay, friendly and very professional. The villa had everything you need for your trip, the beds were comfortable and rooms were always cleaned to a high standard. We had our own private pool which was nice and enjoyable. This was my first trip to santorini and the help provided from maria and her staff was fantastic. 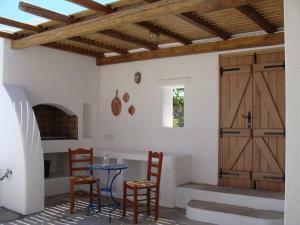 Very easily accessible and considoring that santorini is a small island it was never far from all your needs. Would strongly recommend staying here . Great location if you like to be away from hustle and bustle. Beautiful staff and amazing villas. Great weather and very safe. We loved everything !!! Maria and her team are very welcoming, friendly and helpful. Our view from our villa was amazing. We also had car hire included which was really handy to see the island at our own pace. Lock in a great price for Anema Residence – rated 9.5 by recent guests! One of our best sellers in Vourvoúlos! Anema Residence offers elegant, self-catering villas with private, plunge pools and furnished terraces surrounded by a 6,000-m² plot of herbs and vegetables. The pebbled Vourvoulos Beach is 1,000 feet away, while Imerovigli is 0.6 mi away. Fira Center is 1.9 mi away. Anema villas are decorated with respect to the Santorinian style featuring colorful details. They include a living area with flat-screen TV and DVD player, as well as free toiletries and hairdryer in the bathroom. Upon request, guests can enjoy exclusive services such as private catering, shopping delivery, yoga lessons and massage sessions. Fira, the capital of Santorini, is 2.2 mi, while Athinios Port is at 6.8 mi. Free Wi-Fi is available throughout the property and free on-site parking is possible. 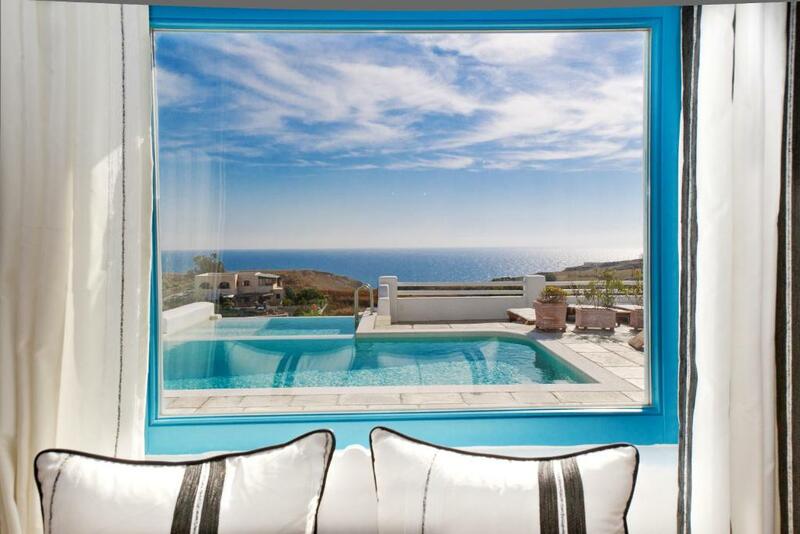 This property also has one of the top-rated locations in Vourvoúlos! Guests are happier about it compared to other properties in the area. When would you like to stay at Anema Residence? -free bottle of wine upon arrival. The package includes free daily car rental (Hyundai Atos or similar category) with basic insurance. 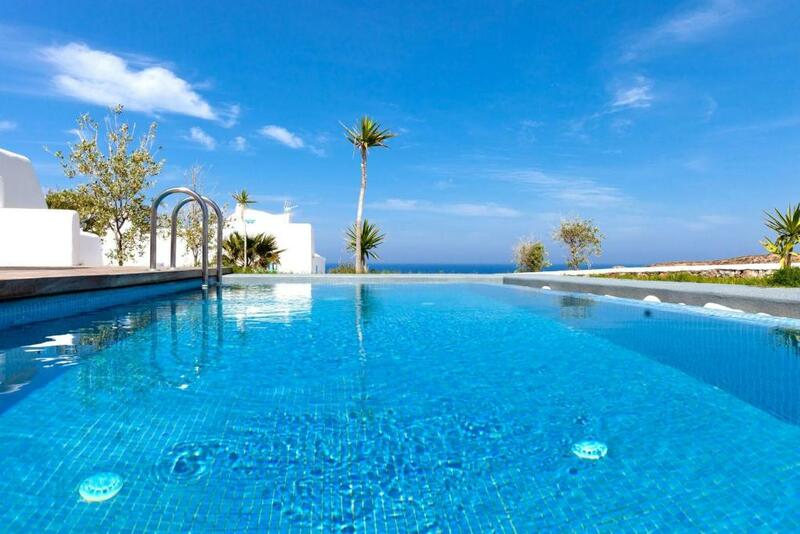 Offering a separate bedroom, this air-conditioned villa has a terrace with sea views. It consists of a kitchen with refrigerator and a seating area with sofa and flat-screen, satellite TV. Please note that this room type does not offer a pool. Please note that the villa and bed type will be allocated at check-in according to availability. Guests may be asked to change villas during the stay, and types may vary. We are not a hotel. We call it "a home away from home". Our vision is to create a complex of villas with private pools, and to welcome our guests as family, to experience the real Greek hospitality that we have inherited from our families. Our love of nature, our history, and our culture distinguish our values. Join us for a glass of wine, become part of the family, taking part in open BBQ's and celebrations. Or enjoy your villa with privacy. The choice is yours. In our gardens you will find fruit and olive trees, fresh herbs, Santorinian tomato plants, white eggplants, local cucumbers, and other seasonal vegetables. All of these are available to you, to use as you prepare that special salad to go with the meat cooking on the BBQ. We will also be happy to introduce you to the Santorini local products, including wine, “chloro” goat cheese, fava beans, cherry tomatoes and our homemade sweets. Enjoy our daily homemade breakfast prepared by our family, using several local products. Don’t forget to try our omelets with fresh local organic eggs. House Rules Anema Residence takes special requests – add in the next step! Anema Residence accepts these cards and reserves the right to temporarily hold an amount prior to arrival. There is a free transfer from the airport or the port. Please let Anema Residence know your expected arrival time in advance if you want to use the service. Please note that extra beds for adults and for children above 4 years old can be provided at extra charge depending on the period. Please contact property for further info. Please inform Anema Residence of your expected arrival time in advance. You can use the Special Requests box when booking, or contact the property directly using the contact details in your confirmation. WiFi is some places weak ..
Maria our host and all her staff were fantastic. They made us feel so welcome and had thought on everything. Their attention to detail was amazing. Car rental was included in our package. We travelled with our 5 month old daughter and Maria provided us with a cot and a car seat. Our villa came with a complimentary bottle of local wine, bottles of water and a bowl of fruit. A staff member even came to our door one morning with a complimentary bottle of prosecco. The on-site bar and restaurant was quiet as it was coming near the end of the holiday season, but food was lovely and very convenient for us with our baby. 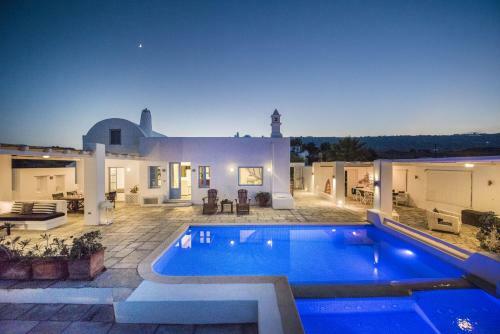 The property is a 10 minute drive from the airport and is 5 minutes from Fira the capital and 10 minutes from the picturesque Oia. Because of the central location and the size of the island , no point on the island was ever more than a 25 min drive away. The property and its staff exceeded all our expectations and we couldn’t recommend it highly enough to our family and friends. Everything is amazing at Maria’s place! Everyting was perfect for us! Everything!!! We had an amazing stay at Anema and would difenitely like to return! Everything was perfect, from the view and the room, quiet but still very close to Fira, very good breakfast and great amenities. Many special thanks to Maria and her team- we’ve enjoyed our stay and although we came as tourists, we left as friends! Maria and her crew are the best. Highly recommended. Wi-Fi is in all areas in the complex but not in our villa. There was no phone signal in our villa, too. Not real espresso. Maria, and the rest of the staff were unbelievably nice and customer oriented. From the moment we stepped into this magical place until we left we had an unforgettable experience. Since the location is not in Oia or Fira and the accommodation comes with a car, you really get a chance to see the entire island, and also have a quite secluded place to come back to at the end of the day. I would recommend this place to anyone! Price of food at the property was VERY expensive circa 12-20 euro for a meal, one dish, when even in the tourist areas they are half this price. You are a drive away from anything so obviously capitalising on people not being able to just duck out and get food. you can get a Gyros for 2.50 euro in a touristy area, don't pay 18 for a pasta in the hotel. The hotel was also kind of Hostel vibe about it. The room we had was semi private, as we had random people walking through out front area at times. For the money you pay i feel like you are not getting much bang for your buck. We enjoyed our stay but most likely wouldn't pay that price for the location and hotel quality again.